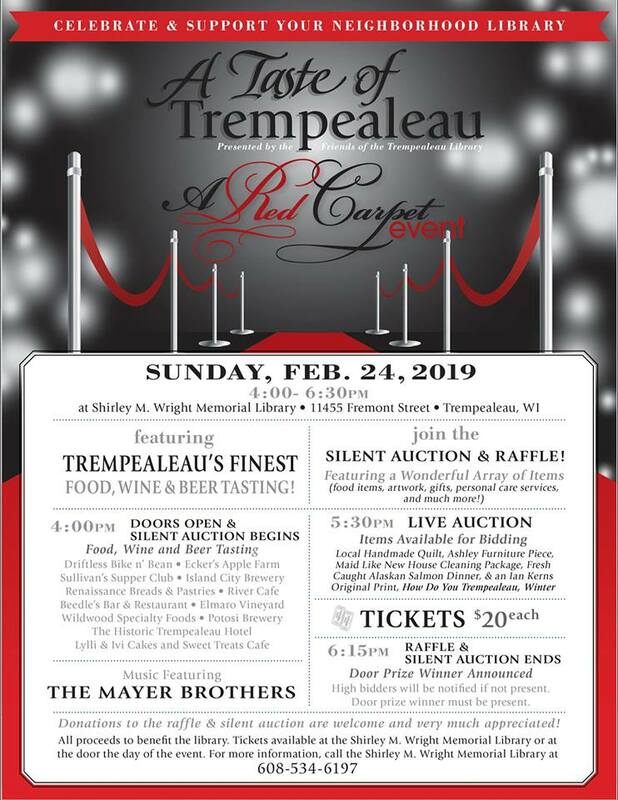 Join the Friends of Trempealeau Public Library for “A Taste of Trempealeau: A Red Carpet Event”, an evening of culinary delights offering samples of Trempealeau’s finest food and wine and both live and silent auctions. Music will be provided The Mayer Brothers. Food, beer and wine will be provided by Driftless Bike n’ Bean, Ecker’s Apple Farm, Sullivan’s Supper Club, Island City Brewery, Renaissance Breads & Pastries, River Café, Beedle’s Bar & Restaurant, Elmaro Vineyard, Wildwood Specialty Foods, Potosi Brewery, The Historic Trempealeau Hotel , and Lylli & Ivi Cakes and Sweet Treats Café. This will be held from 4:00 to 6:30 pm on Sunday, February 24th at Trempealeau Public Library. Tickets are $20. All proceeds benefit the library. Tickets are available at the Library or at the door on the day of the event. Call 534-6197 for more information. Proceeds from this event have supported the library’s summer reading program, purchased furniture and upgraded the library’s audio and video services.